"How and what we eat has changed dramatically in the last 100 years and this is especially true for our children, who tend to eat more processed junk food," says Caroline Harmer, a nutritional advisor to digestive health experts, Renew Life (www.renewlife.co.uk). "In one study of 12,000 school-age children it was found that those who ate the most junk food (at least one meal daily) had slower academic growth in key areas such as maths, reading and science, compared with students who did not eat processed food. We thrive on a whole food diet, rich in plant-based nutrients from fruits and vegetables and omega-3 fatty acids from fish, nuts and seeds. Remember that the foods we eat today are the building blocks of every cell and tissue in our body tomorrow." 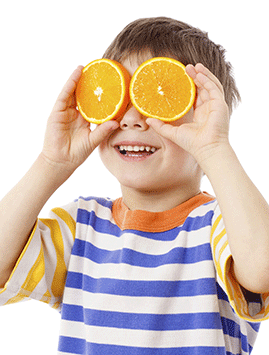 "There is a simple way to support your child's brain power and memory," says Caroline Harmer. "Recent studies have confirmed that boosting your child's intake of omega-3 fatty acids, in particular DHA, may be a simple way to support measurable improvements in their brain function. Low levels of DHA and other omega-3 fats are associated with poor reading, memory, behaviour problems, low mood, attention deficit hyperactivity disorder (ADHD) and dyslexia. Research has found that children consuming omega-3 fatty acids consistently outscored the placebo groups on rule-learning, vocabulary and intelligence testing. Current guidelines for omega-3 fatty acid intake recommend at least two portions of oily fish a week, such as salmon, sardines, anchovies and herring." After a long day at school, it can be tempting to let the kids flop into an armchair and play a computer game. But if they have been sitting behind a desk for the majority of the day, this isn't going to help their general fitness or posture. "We are seeing increasingly higher numbers of children coming in for treatment with back and neck pain," says chartered physiotherapist Tim Allardyce (www.surreyphysio.co.uk). "There are several reasons for this. Children are generally not as fit as they were several decades ago. This is because of rising obesity and technology changing the way that children 'play'. Playtime once meant kicking a ball around the park, but social media has now encouraged children on to armchairs. A lack of general fitness means less muscle strength and mobility, so the spine gets weak and stiff, contributing to back and neck pain." Tim's advice is to introduce kids to sports they might not have done before to keep them interested. And if children are sitting for long periods, encourage them to get up, ideally every five to 10 minutes every hour. Poor posture can affect us in the long term, so make sure you spend time finding the right backpack for your kids. "Prevention is the key," says Tim Allardyce, "and stopping poor posture before it's even happened is far more effective than trying to fix poor posture after it's happened." Tim recommends ensuring that backpacks are size-appropriate to the age of the child. "Very large backpacks on small children are of course going to be an issue," he says. "Use a backpack with two straps and keep the straps shorter on backpacks so the bag sits slightly higher up the back. Use lockers at school as much as possible, and check the bag for unnecessarily weighty books." Lastly, encourage children to hold up their smart phones and tablets as high as possible, so they are not constantly adopting a forward neck (rounded back) position. Colds and viruses seem to be an inevitable part of the return to school, with infections often spreading throughout the classroom. "Challenges to the immune system can be beneficial to the child as it helps to strengthen their immune system over the long-term," says Tim Gaunt, director of sales for Natures Aid (www.naturesaid.co.uk). "Supporting the body throughout this time of increased exposure to infective organisms is an important part of building an effective immune system. Nutrients that have been used to support children as they go back to school include the age-old favourites such as vitamin C, zinc and echinacea (over-12s only) but in recent years we have seen the emergence of vitamin D as a powerful weapon in our natural arsenal in the fight against viruses and bacteria. For younger children, vitamin D3 drops provide this important vitamin in an easy-to-use drop so that mums can look after their children by adding it to juice or food." Try these healthy lunchbox ideas from Shona Wilkinson, head nutritionist with the NutriCentre (www.NutriCentre.com). Stir in home-made fresh fruit purée into natural yoghurt. To make the purée, peel and chop fruit such as apples or pears, add to a saucepan with a couple of tablespoons of water and simmer until the fruit is soft. Purée in a blender until you reach a smooth consistency. Chop up carrots, red or yellow peppers, celery or cucumber and serve with hummus or sour cream with chives. Full of vitamins A, C, K and fibre, kale chips are an excellent way to get your child to eat more greens. Make your own by baking kale leaves in an oven at 200°C for 10 to 15 minutes. Leave to cool and serve.